I am on the faculty of The Juilliard School (MAP), SUNY Purchase Conservatory of Music, a founding member of Flutronix and a passionate teacher! First and foremost, I have a profound love for teaching. Other than taking great pride in my students' progress and achievements, I find teaching to be a way to continue discovering possibilities of the flute. As a teacher, I have to find the best method to communicate to each of my students, as everyone learns differently. Discovering various ways to explain concepts and techniques has allowed me to understand music and flute playing on a very deep level and everyday it brings something new. Teaching is exciting, challenging and rewarding, and it's become a crucial part of my career as a professional musician. My students learn skills to develop their tone and technique, all while studying etudes and standard flute repertoire. Particular care is taken to foster each student’s unique artistic voice and concept of sound. Depending on the student’s interest and level, additional time can be spent on improvisation and memorization. Often times lessons end with sight-reading flute duos, which further enriches the student’s listening and ensemble-playing ability. I am a warm and understanding teacher who believes the study of music should be fun and engaging. But, I also believe in being disciplined and I have high expectations for my students when it comes to their own commitment. I pay very close attention to each student's needs, musical interests, personality and style. My studio has a reputation for having a fun, warm atmosphere, while seriously advancing students' abilities in flute performance and music in general. Lastly, because I have such a varied performance career, I bring a unique perspective to my studio. While I am highly versed in the classical repertoire and pedagogy, I actively compose, improvise and perform in styles ranging from pop to folk to experimental. This has proven to be a unique asset to students interested in exploring various styles and thinking outside of the box. Sample Method books: Taffanel & Gaubert, Altes Etudes, Anderson Etudes, Cavally Etudes, various Moyse tone exercises, Berbiguer Etudes. 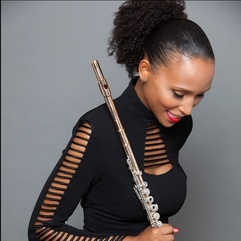 All major flute repertoire can be taught, determined by the student's level. Flute Teacher. Flute studio class coach. I am on the faculty of The Juilliard School's Music Advancement Program, which serves intermediate-advanced youth with weekly and vigorous music instruction. There, I have a number of flute students and I also coach the flute studio class. I am a member of the Music Leadership faculty. I earned my Masters in composition with honors distinction. I earned my Bachelor's of Music and Performer's Certificate in flute, studying with Dr. Tara Helen O'Connor. Allison was one of the best teachers I have ever had because although she was strict she was also a fun teacher to work with... Although Allison is a more down to earth teacher, you must always be prepared for her classes to keep up with her. I recommend Allison as a teacher to people who have a passion for their instrument and strive to succeed. My tone and general way of playing has gotten so much better with the help of my private teacher Allison. I am so much better of a flute player because of her. Take live online video lessons with professional, passionate Flute , Piccolo flute or Composition teachers from around the world. All you need is a computer equipped with a webcam and microphone. Learn more about how it works.